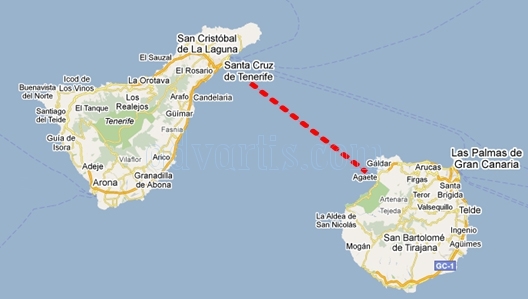 Christian Jongeneel completed the challenge of joining together the distance between the islands of Tenerife and Gran Canaria, about 70 kilometers. The swimmer makes history by completing the 70 km stretch without neoprene. The dreams of the shark Christian Jongeneel. The last feat of the competitor without frontiers. Christian Jongeneel (Malaga, 1974) long distance swimmer in open water joined Tenerife with Gran Canaria without neoprene. He kissed the Port of Agaete, about 9.00 yesterday, after having passed a hard physical and mental test. Its tenacity is already history. He traveled the 70 kilometers that separate the islands in 16 hours without the mentioned protective suit, facing the complex conditions of the sea and after much suffering due to the cold and severe stomach problems. It crushed the physical and psychological complications of a feat that makes it the new high-speed ferry. “The hardest moment was the last hours of the night when he had to fight so that his mood did not deteriorate,” explained one of the members of the technical team of titan Jongeneel. During the crossing the sea was calm, but at the exit of Tenerife it faced the north current and the high number of hours without light. He is the first athlete of history who has achieved this challenge without any element of external help and with a water temperature that was around 20 degrees during the night. The initiative has been supported by Costa del Sol Tourism and the Real Club Nautico de Tenerife. And yesterday, in Agaete, a final point with epic dyes was illustrated. 70 kilometers, 16 hours, 30 minutes and an average speed of four kilometers. “It’s been a very hard and very long night, I never had a sunrise, I’ve had waves, and in the end it’s true that the waves have helped us and pushed us to arrive a bit earlier but we’ve had a lot of complications. the crossing is not when I touch the island in front that is the Gran Canaria but when we finish collecting what is needed for the project of the Vicente Ferrer Foundation, “said Jongeneel in Agaete. A double challenge has been raised again, the physicist has succeeded and the solidarity is about to do so. On this occasion he supports a project of the Vicente Ferrer Foundation (FVF) to rebuild a shelter where 25 children from South India will live, raising funds through migranodearena. Guaranteeing the conditions for these minors to access nutritional, educational, health and social integration support is the objective. The swimmer, through Brazadas Solidarias, a solidarity organization for sporting events, faces extreme challenges in the seas and oceans of the world with the aim of raising awareness and raising funds for the Vicente Ferrer Foundation (FVF). Christian has faced crossings of the Strait of Gibraltar, the English Channel, the Cook Strait (New Zealand), the Al-Assad crossing of Syria, the Santa Catalina Canal, the Gateway of India (Mumbai), Peniche-Islas Berlengas (Portugal) and the Menorca Channel, among others. And in September 2017, he became the first European to drive Manhattan twice, a 92-kilometer course that he completed in 20 hours of swimming. Jongeneel emphasized the solidarity and revealed that he thought of leaving. “The forecasts indicated that we could finish the 70 kilometers in 18 hours, but it was done in 17 (…) I’ve had a terrible time, it’s been one of my worst trips, I had vomiting, dizziness, nausea … The sea and the worst moment was at night.It was very long, you have to leave your mind, but you think about the solidarity project and it is a very strong ally. Braces and miles for a smile in India. Jongeneel, the hero who united Gran Canaria and Tenerife for the noblest cause.